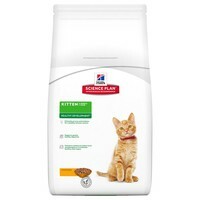 Hills Science Plan Healthy Development Kitten Food (Chicken) has been specially designed for kittens and pregnant or nursing cats. It contains balanced nutrition to promote healthy growth and development and is highly digestible. Hills Science Plan Kitten contains Hills Superior Antioxidant Formula to support the immune system, Taurine to help maintain normal heart function and retinal structure and controlled levels of various minerals such as calcium to ensure the development of a healthy, strong cat. Provides balanced nutrition, controlled growth with high digestibility. Contains Hill's Superior Antioxidant Formula to help the immune system. Contains Taurine to maintain normal heart function and retinal structure. My kittens love this food; unfortunately, so do my adult cats, and they are a lot harder to please than the kittens.